We’re Saucing it Up this week for #SundaySupper. I had hard time deciding what to make this week because here are so many ways to interpret this theme. Ultimately I decided to go with a super simple tomato sauce for pasta. When I made this recipe the other day it was the first time I had ever made it. I was really please with how it turned out. It takes basic ingredients and turns them into so much more. Heat the oil and butter in a 2 quart sauce pan over medium heat. Pour the tomatoes and juice into a sieve over the sauce pan. Press the tomatoes through the sieve leaving the seeds behind. Add the basil, salt, and pepper. Simmer the sauce for 30 to 40 minutes or until reduced by about half. Pour over pasta and toss well. 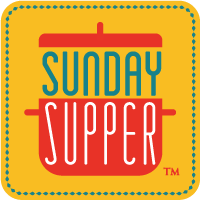 Be sure to check out what the other #SundaySupper bloggers are sharing. Simple is always yummy! This recipe screams comfort food in my book. Yum! Love this recipe!!! Simple is sometimes the best. This is one of my favorite kind of sauces. It’s so light and delicious and loaded with flavor. Awesome recipe! Simple and delicious. My kind of sauce! Lovely sauce!! It is breakfast time but I am craving pasta now! Love simple tomato sauce recipes! I’ll be adding this one to my list! Yep. Simple ingredients can still be flavorful. It looks delicious and thank you for participating this week. I love simple recipes that let the true flavors shine through. This sounds so good! Micha, this looks SO good, I love the various colors! Saving this recipe for the Neapolitan Sauce!! Simple is the only way to go with pasta. This sounds fantastic! So simple but that lets everything shine, lovely sauce!! This looks wonderful and so authentic! A simple marinara sauce on angel hair pasta is divine – Your version looks fantastic! This is so simple but so delicious! I love meals like that, especially when it’s a tasty flavourful sauce like this over angel hair pasta (one of my faves).